Where is the money Project W? Wits University has confirmed that Project W is under investigation after allegations of not depositing fifty thousand rand that was meant to be their contribution to the Humanitarian Fund. 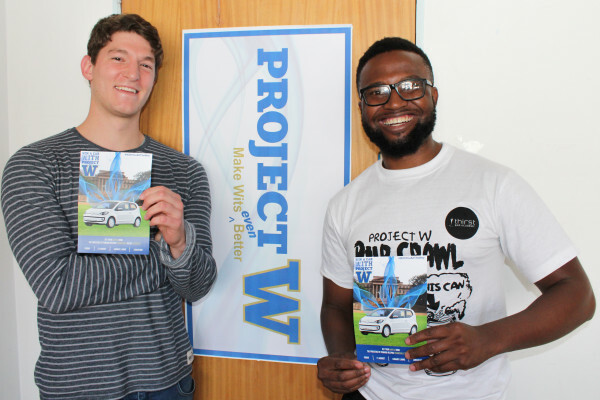 The win-a-car raffle that Project W was running during their election campaign was cancelled because of the investigation. “Project W had to be guided about the appropriate University procedures to follow in this regard and they are now addressing the gaps in the process,” said Dube. SHOWING INITIATIVE: Project W’s Jamie Mighti stands with a flyer with information about the win-a-car initiative at the Project W office. Wits Vuvuzela contacted Shaeera Kalla, acting president of the current SRC. She said that the SRC had made inquiries about the missing money since January. The fifty thousand rand was raised by Project W last year for a raffle to win an iPad. Kalla said that this money was supposed to go to the Humanitarian fund but she has yet to see the money deposited into the fund. Kalla said that the money has not been accounted for by Project W and upon asking the party about the funds they refused to respond to her. “We feel the university has protected Project W for fraud,” said Kalla. Jamie Mighti a prominent member of Project W, was not available for comment at the time of publishing. An earlier version of this article incorrectly stated that Jamie Mighti was a former leader of Project W. As mentioned here, Jamie Mighti is just a member, of Project W, who often makes statements on behalf of the organisation.